Again, gluing the detached brackets to fiberglass front end thread! Up 'till now, we've been really lucky with all the glue joints and attachment points on our coach, an '04 Itasca Horizon 36GD with the C-7 330HP CAT. Over the years, I've read thread after thread about how folks have had many different components break loose from the glue that Winne used at the factory. Well, it's happened to us. I have two broke-loose glue joints, on/in one bracket, for the d/s of the front of the coach, right next to the generator slide out panel. You'll see in the pictures what I'm talking about. It appears, just like some of you have said in the past, that there was little to no real prep for the gluing of this joint. Yes, the many others on the coach are still holding. It's just these two that have given way recently. I do a fair inspection for this kind of issue on a semi-regular basis, anticipating something like this would one day happen. Well, guess what, it did. So, now, some of you would advise to hurry up and get on the phone to the factory to see what they use. Well, the coach is an '04, what they used back then, is way more than likely what they're NOT USING TODAY. Second, some of you have used a product made by 3M, numbered "5200". Just about all who've used it seem to be pretty happy with the results and, so far, I don't think any of yours has let loose. Some would recommend JB Weld. No doubt about it, they make good products. The only problem is, WHICH ONE of their many products to use? Then there's "Gorilla Glue". Some have reported using it in many applications like this and, with great success. Not sure on that one. Then there's the ole' "Two part Epoxy" stuff, in many forms, made by many companies, for many purposes. I have some made by Loctite and, I've used it many, many times on various repairs, all around the house and even some on the M/H and, it's never failed me yet. I've heard of and seen a product called "Sikaflex" too. Not too much on how much it's been used and the success for this application. So, in the pics below, you'll see what I'm up against. It's not a hard job. But, I can prep the metal in seconds by simply roughing up the surface to bare metal. 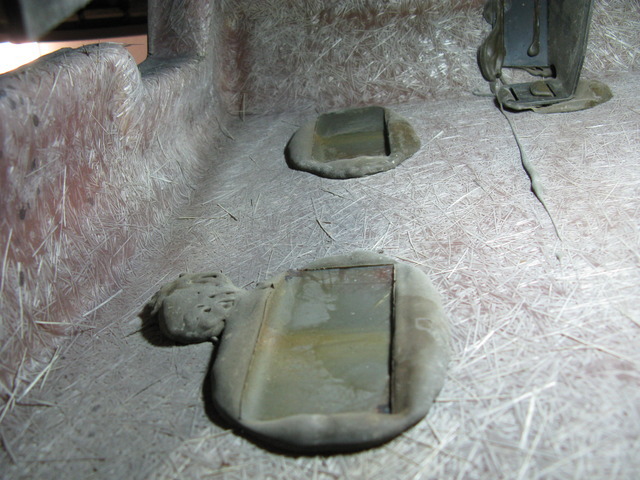 But, the pics show the original glue/adhesive still very hardily stuck to the interior of the fiberglass. Now, I've taken my trusty steel blade 1 1/2" non-flexible paint scraper to it and, THAT IS SOME SERIOUSLY TOUGH STUFF! Trying to get it off, is for the most part, completely impossible. You can chip away at it but, it's pretty much on there for the duration. Too bad it didn't take hold of the metal side that good too huh? Anyway, my thought is, grind/sand up the metal for prep of whatever kind of adhesive is determined to be used. Then, scrape the flat area where it was glued before to gain a fresh surface. Then, very aggressively wipe the area down with alcohol a few times to really make sure the area is spotless and has no oil or any other residue. Then, apply whatever adhesive to both surfaces and, jamb them together. I really don't have a way to clamp them due to the throat distance. A welders 12" clamp may do it for the bottom 1/2 but, not for the top. I'll figure that one out. I'm pretty good at MacGuyvering things. So, what do any of you experts in this kind of repair, think about applying whatever kind of adhesive is chosen, right over or onto I should say, the old adhesive? I know the newly prepped metal will adhere to anything but, I'm just not sure of adhering to old adhesive. But, as a prommissing side note, that old adhesive is definitely on there for good. Fire Up, while I have not yet experienced glue joint failure ('06 Journey) your pictures tell the tale very clearly. 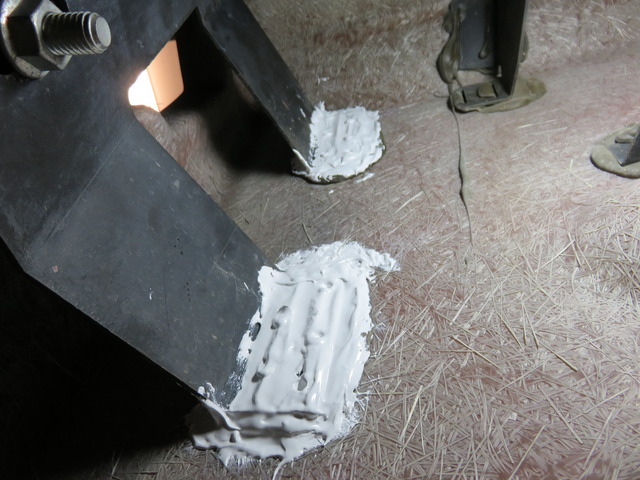 My guess is the initial epoxy adhesion to the fiberglass was due to its rough surface that's perfect for a secure bond. The metal bond was poor due to the smooth surface of the metal. If/when I experience this, I would rough up the old epoxy with a stiff wire wheel, drill a few 1/4" or 3/8" holes in the metal brackets, lay a new epoxy bed over the original bed and press the metal brackets back in place. The epoxy will ooze through the holes and form a rivet that will hopefully increase the strength of the joint. Once the epoxy begins to set up but is still manipulable, I would form it over the edges of the metal brackets to further increase the overall bond strength. Dan pretty much covers what I'd recommend, even though I haven't had to make this repair. Your ideas for prep are right on the money. I've rarely had an epoxy joint fail, whereas I have experienced that with other adhesives. That said, is there any way you can get fasteners into the metal from the outside of the fiberglass? Three to four fasteners per pad, plus the epoxy, should ensure you won't have to repair this again. They could be drilled and placed after the epoxy has cured, although they will provide the clamping force if placed before then. I keep a set of West System 5-minute epoxy bottles around for most of my work, but for this I'd recommend a slower-set epoxy, for strength. As to using a specific product, I can't say. I suspect that the "really good stuff" is, like high-bond tape, available only in bulk for sale to commercial customers. Buy a fiberglass repair kit. Clean up the area so everything is roughed up well. Cut up some of the fiberglass mat with scissors. Cut it up until it is very fine. You can buy Flox which will accomplish the same thing but the glass is just fine. Mix some epoxy in a paper cup and add the cut up glass. Mix until it is peanut butter like consistency. Use that mixture to reconnect things. 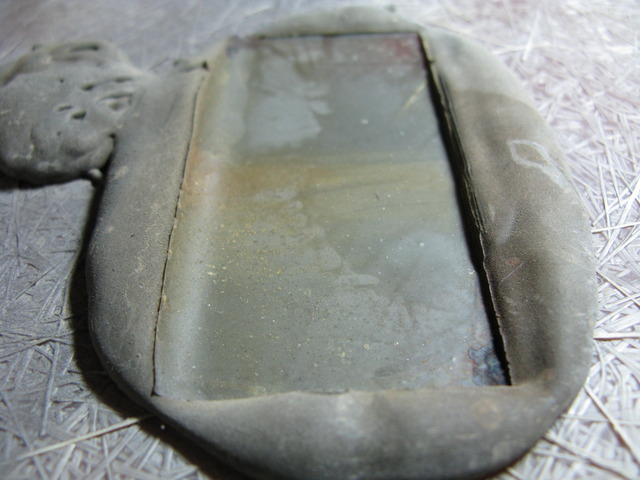 The little glass fibers will hold things together. Lay a layer of glass over the metal when in place and all of the peanut butter and glass will hold fine. I had about the same thing happen on a previous 2003 Chieftain. I drilled about 6 holes on the mounting bracket and used JB weld which oozed through the holes. When I replaced the bracket, using bracing until it dried, it never came lose again. I did not use the JB-Quick as I believe the slower drying is stronger. Good luck with your project. I had a similar problem and used Gorilla Glue which although it took a few days to completely set and dry, formed a very strong bond. I also had it ooze through the holes and set just like a rivet. Perhaps after roughing up the old epoxy, drill several shallow holes in it. Also maybe cut some grooves in it with a box cutter. Something for the new glue to sink into. Drill some extra holes in the cleaned up metal. 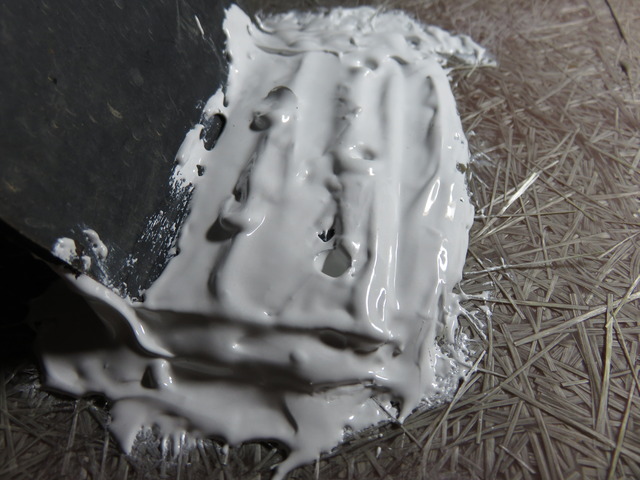 Then mixing glass pieces into epoxy as YC1 suggested and using it like putty. I most sincerely want to thank you for getting back to me on this. I've got lots of epoxy experience on/in projects. It appears that, as I kind-a figured, many of you have different ideas on just what kind of adhesive to use. The procedure for the mechanical side seems to be a majority thing, rough up both surfaces, drill the metal, and possibly drill the existing dried adhesive, clean all areas really well, then apply the new adhesive, either a putty type or, something similar. As for "drilling" and through-bolting it on, well, I can do that. I'd head on down to our local ACE hardware where they sell either polished Stainless Steel bolts or, Chrome ones. My whole life has been "thinking outside the box" and, that was the first thing I thought of as I found those broken joints. But, at present, I think I'll give the new adhesive, WHATEVER brand/makeup it is, a try and see how well it works. Thanks very much for the suggestion. Had one loose bracket on each side. Originally used liquid nails. One held (still holding) the other came loose. So, used some gorilla glue. Drove to Fla and still holding. For my repairs I used 5 minute JB Weld. I like the quick setting because I can just hold the part in place until it doesn't move, instead of using some awkward clamping solution. Probably not as strong as the regular JBW, but it has held for me. Be sure to remove the paint from the loose component and rough up the surface. If Winnebago had done this the brackets probably wouldn't be falling off. I did pretty much what most of you suggested and, that was to scuff up the metal brackets with some seriously rough sanding discs (40 grit). Then I drilled them with 1/4" holes and even left the burrs on the back side to act as "barbs" for the oozing new adhesive. I also scuffed up the old adhesive and also drilled it with smaller holes. I really had to be careful on that one. One slip and, yeow.....I'd have gone right through front cap, on the lower side. That would have not been good. Anyway, I finally decided on a product to use. I already had this stuff so I figured what the heck, all kinds of epoxies have been mentioned so, I'll give this a try and report back. The product is called Marine Tex. it's primarily used in the Marine world of boats, Yachts and the likes. It too is a seriously strong epoxy. I mixed a rather large batch up and, you should have seen the smoke emit from it while I was mixing it. I forgot about that. Anyway, I used a plumbers acid brush to apply it to both components. I mixed it to the point it was barely brush-able. That was good because, I was working with a vertical surface anyways. I brushed it thick on all four surfaces and, stuck them together. As expected, it oozed out of all the holes I drilled. 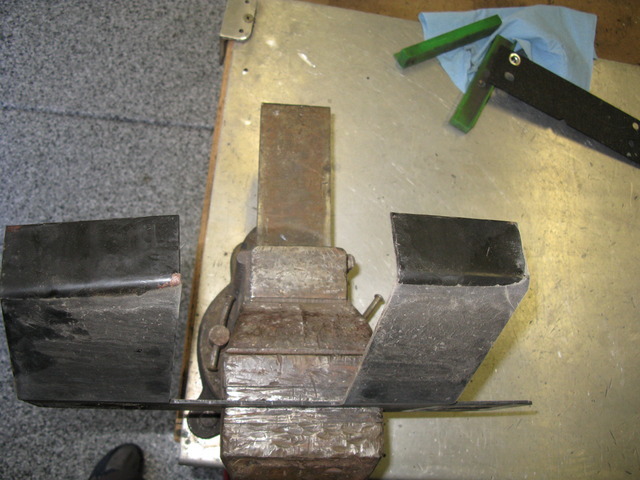 Due to the proximity of where the joints were located, clamping them was impossible. So, I pushed them together as hard as I possibly could which, appeared to be as good as the original joints were done. I then slightly bolted the bracket to the sub frame parts where they belonged. That held everything in place, 'till the Marine Tex got setup which, was not all that long. I went out and checked it about 2.5 hours later and, it was about 90% cured. If I can link the pictures of the finished job, I will. They're not pretty but, I wasn't going for pretty. I was going for as good of a re-glue as I could get, no matter what it looked like. Not many people will see them anyways, unless they feel they need to crawl under the front section of our coach.